M.E. patients are often nocturnal creatures- not by choice but as a consequence of their illness. It is a bitter irony that many of us feel the desperate need for sleep during the daylight hours but as soon as nightfall sets in, so does the insomnia or unrefreshing sleep. This is from the Living with CFS blog. If ‘malaise’ doesn’t adequately describe my dreadful condition after too much exertion, it does fit another consequence of ME/CFS. After so many years of trying to pace myself successfully (whatever that means, since my over-taxed level seems to change from week-to-week or even day-to-day), a kind of ‘malaise’ has settled like dust into my bones and brain, bringing boredom and lassitude (mental weariness, listlessness or languor). A New Name for ME/CFS? Chronic fatigue syndrome is real and doctors should take it seriously, the influential (American) Institute of Medicine said in a report issued this week. The report goes on to say it needs a new name to distance it from the stigma of being an imaginary illness, and doctors need clear criteria to diagnose it. “The committee recommends that this disorder be renamed ‘systemic exertion intolerance disease’ (SEID),” the panel of experts said. “SEID should replace myalgic encephalomyelitis/chronic fatigue syndrome for patients who meet the criteria set forth in this report.”A just released IOM report not only proposes a new way to diagnose ME/CFS, but came up with an entirely new name for the disorder as well. Very interesting article looking at the links between poor and unrefreshing sleep and ME/CFS and the efficacy of various treatments. I was particularly taken by the suggestion that there might be a link between the neuropathic pain I have, particularly at night, and my own difficulties in getting to sleep. A recent study found that neuropathic pain activates a part of the brainstem (the locus coeruleus) that promotes wakefulness. Another study found that neuropathic pain induced the firing of serotonergic neurons, again in the brainstem, that increased wakefulness and reduced deep sleep. If these studies are correct it’s not the pain per se that’s keeping people awake, but the promotion of wakefulness by the brainstem. Bansai recently proposed brainstem problems could help explain the extraordinary debility and sensory problems often found in the most severely ill ME/CFS patients. The full article is in Health Rising. Take the pieces of a big puzzle – piece a few together, scatter some of the rest on the floor, and then throw the box and the rest of the pieces away – and that’s what we’ve had with Chronic Fatigue Syndrome. We’ve had a few pieces of the puzzle, some of which fit together (and some of which didn’t appear to) but nowhere has the broad outline of the puzzle – the disease – been apparent. Dr. Lucinda Bateman thinks that’s changing. 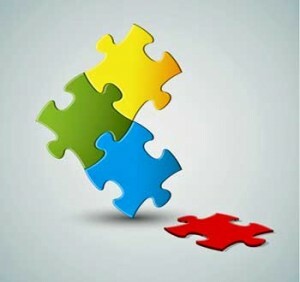 In an article in Health Rising and a videotaped talk for OFFER she stated she believes the broad outlines of the ME/CFS puzzle are now visible, and as they continue to become more visible we’ll be able to fill in the pieces of the puzzle faster and faster. The Kemptown based Sussex ME Society, which cares for those affected by Myalgic encephalopathy (ME) or Chronic fatigue syndrome (CFS) in the area, is currently highlighting the cognitive problems sometimes experienced by people with the illness as this aspect is often not generally recognised. Cognitive deficits are often the principal disabling feature of ME. Such deficits restrict the patient’s ability to function, plan, and complete tasks in real world settings. Documented deficits include impaired working memory, slowed processing speed, poor learning of new information, decreased concentration and attention span, difficulty with word retrieval, and increased distractibility. Cognitive functioning may be disrupted by multiple stimuli and fast paced activity, and even routine social interactions. Patients may be unable to sustain such efforts over prolonged periods where consistent performance (e.g., work, school) is required. Intense cognitive activity in itself can bring about diminished cognitive functioning as well as other post-exertional symptoms in a manner similar to that caused by physical exercise. Your dog can’t tell you when she’s feeling sick, but even so, you know. She moves slowly, she doesn’t eat, she sleeps a lot, she curls up in a corner by herself. “Sickness behavior” is shared by all mammals, and in humans it’s been shown to include fatigue, cognitive problems, body aches and pains and disturbed sleep. These symptoms sound very familiar to patients with ME/CFS and fibromyalgia, and recently several researchers have suggested that many core symptoms of these illnesses could be the result of sickness behaviour biology gone wrong. Sickness behaviour is normally a good thing, helping us survive by resting to fight off infection. But it evolved as a short-duration response, and may be harmful if it sets in for the long-term, perhaps playing a role in ME/CFS. In other words we got sick but the ‘sickness switch’ was never turned back off. See Phoenix Rising’s full report parts one and two.